March 15, 2019  Brexit has convulsed Britain like no other political event in decades. At the end of a week in which Parliament held key votes, things look considerably different than they did on Monday. 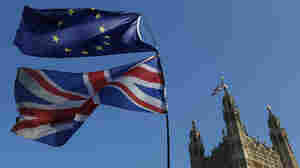 March 14, 2019  In a vote Thursday, the British parliament voted overwhelmingly to delay the Brexit process beyond the country's planned exit date of March 29. March 12, 2019  With just 17 days before the United Kingdom is due to leave the European Union, members of Britain's parliament voted against Prime Minister Theresa May's Brexit plan by 149 votes. March 12, 2019  British Prime Minister Theresa May has returned from meetings in Strasbourg, France, ahead of Tuesday's crucial vote on Brexit in Parliament. May has secured new promises from the European Union. March 11, 2019  Lawmakers will vote on whether to postpone Brexit beyond the March 29 departure date, but there could be a hitch. Here's what to know. March 11, 2019  The United Kingdom's once vibrant auto industry is in crisis, battered by falling sales in China, a collapse of demand for diesel in Europe and profound uncertainty surrounding Brexit. March 10, 2019  A series of crucial votes are planned in the British parliament this coming week, as the March 29 deadline for leaving the European Union approaches.